Each year we work with the student jewellery designers at Central Saint Martins in London, giving them an opportunity to experience designing with pearls for their final year collections. We will be awarding the Winterson Prize 2017 to one of the students for ‘The Best Use of Pearls’ at the CSM Jewellery Awards Evening on 22nd June. 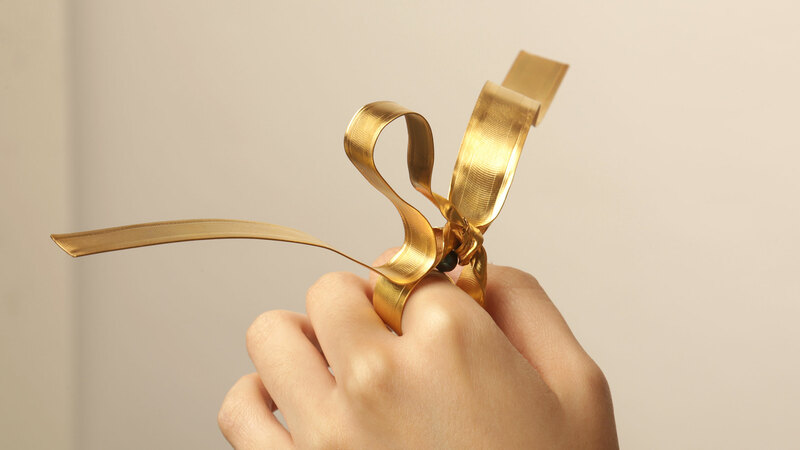 The BA Jewellery graduate collections are exhibited at CSM and open to the public from June 21st - 25th. Here we feature the first part in a series of short interviews with designers from the CSM Jewellery 2017 show, including in this article - Annie Kim, Biwa Pik Wa Wong, Ely Cao, Georgina Hopkin, Holly O'Hanlon and Jieun Kim. Read about the other designers in Part II of this series and the winner of this year's prize. My name is Annie and I was originally born in Korea, then at the age of 13, I decided to study abroad in Manila, Philippines by myself to learn English. As I always had my passion towards Arts, I moved to London for high school and aimed to apply for Central Saint Martins where I could open my vision towards Jewellery Design. I did my foundation course in CSM and continued my study for BA jewellery design at the same college. What was the inspiration for the 'Re:Heritage' collection? This collection encapsulates my personal awareness of Korean heritage, focusing on traditional patterns drawn from architectural structures and details of temple facades. As a Korean person, who left my home country at an early age, I want to reconnect with my cultural roots and so I chose to work with details of my heritage as inspiration for my BA jewellery collection. In my design research I focus on the graphic surface patterns and motifs found on ceramic tiles and also wooden panels in temples. I believe these to be culturally meaningful and too important to be forgotten and seen as “old” or “passé”. They represent Korean heritage, and so carry both visual and cultural value. Inspired by the architectural constructions of the temples, each earring design is layered and at times articulated, in its construction. I was amazed how each space is filled out with such a fine detail, while also considering very much vivid colours. What do you find inspiring about pearls? It is the first time I have used pearls within my work and I think this material has a strength and a characteristic representing elegance and purity. The colour on the surface not only has one dominant colour, it glows and shines in different angles. I was inspired by how adding a single pearl with my pieces changes the mood. Not only did it turn my piece from 2 dimensional to 3 dimensional, it allowed me to add another texture and colour that matches well with any kind of metal or precious stones. I have discovered that pearls do have wider possibilities of transforming, while they are also very fragile. For one of my pieces, I had to enlarge a hole size, up to 2mm with a 7mm pearl size, which was a big pressure given to the pearls. However, the pearls were stronger than I believed and also had so many different ways of connecting them together involving other materials. The simplest way of keeping up the pearls was able to show their best purity. Throughout my researching of artists, I have admired the work of Susan Collis. She uses mother of pearl as one of her materials and I was intrigued by the way she displays the material with daily marks on natural objects. It was a simple display that showed the characteristics of the mother of pearl that matched really well with our everyday objects. Not only this collection does this endorse Koreans, I wish to encourage others to wear it also. My main theme and inspiration comes from Korean heritage, however, I wanted to create a collection that others can easily adopt while wishing them to be attracted to wear my jewellery as well. Allowing them to get comfortable with my country’s craftsmanship was the aim and the invitation. I believe speaking out and directly showing what your inspiration is; in your design the main key is to be classic. Once a designer has a theme or meaning, I think it is important they show that straightforward towards the shape or pattern of the piece. Pieces that includes more meaning and asks the audience to think through might appeal more personal awareness of that particular designer. Also, I think using materials that are commonly known to be classic or simple/pure should take up a big role. Textures and colours are also important while designing. I wish to learn wider skills and understanding in jewellery world. I think there is so much more I need to discover and learn from designers and artists who are much experienced than me and that one day I will get a chance for me in future to teach others about jewellery and arts. I am from Hong Kong, China. I like making things that really reflect myself and relate to myself. Combining traditional and comtemporary ideas together, to consider design conceptally and visually. What was the inspiration for the 'Made of China' collection? The title of my collection is ‘Made of China’ as I am using China,the porcelain mostly in this collection. Porcelain may typically be associated with chinaware, but my Made of China, hopes to break that stereotype. By transforming the material into wearable ornaments, I introduce it as a versatile substance that can be utilised beyond its original purpose and reflects my heritage. 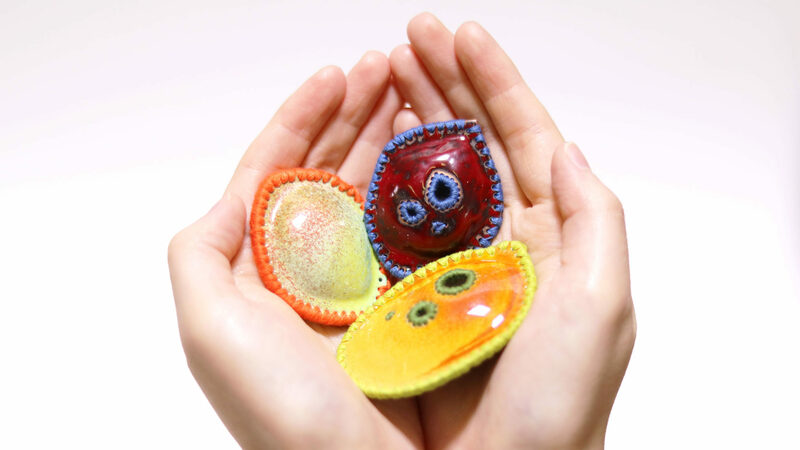 Combining traditional and contemporary techniques, the pieces are crafted from traditional porcelain beads embellished with handwritten texts, high-strength ceramic beads adorned with lithographic decals, and 3D-printed ceramics. The result is a sleek and minimalistic set of grandes complications personifying Chinese philosopher Zhuangzi’s idea of damei or “great beauty,” the concept of understated elegance that originally inspired the collection. Truly embodying the “less is more” maxim, Made of China is a delicately refreshing alternative to today’s tendency towards excess. As I am using porcelains, challenging the techniques of making porcelains balls,I found a technique in a ceramic company in Jingdezhen which is a ceramic town in China which specialized in making porcelains ball with a pearl finish. The balls are as glittering and translucent as the pearls,so I used real pearls with my porcelain balls design to enhance its luxury. Whilst I have been working with pearls, I discovered that pearls are really easy to work with but also hard to work with. A single pearl is a piece of jewellery that has its own different colour, shape and gloss. Designing with pearls is not easy - how to bring the most out of a pearl and not going too far is what I should consider when I am working with pearls. A girl with real class. Trained to be an architect, changed mind before my BA to work with smaller scale 3D pieces. What was the inspiration for this 'Silk Menagerie' collection? My belief, my cultural background and my aesthetics, as a jeweler, an embroider, an animal-lover and a Chinese. Their unique aura, which is not provocative yet stands for itself. It is a fragile but strong material. With the right amount, colour and shape, it lights up the whole piece. Tadao Ando and Christopher Lemaire, they work in different fields but share a unique sense of satiety, a balance between material (materials if necessary) and empty space. Personally, I don’t wear jewellery as I don’t wanna label myself as a certain type of jeweller, similarly I don’t label my jewellery to certain group of wearers. I will leave the choice to wearers and my pieces. A sense of satiety. Every details tells the same story, yet represents its own reason of existence. The existence and emptiness create harmony. I was offered two places - one in RCA Jewellery Metal and another in RCA Fashion millinery. 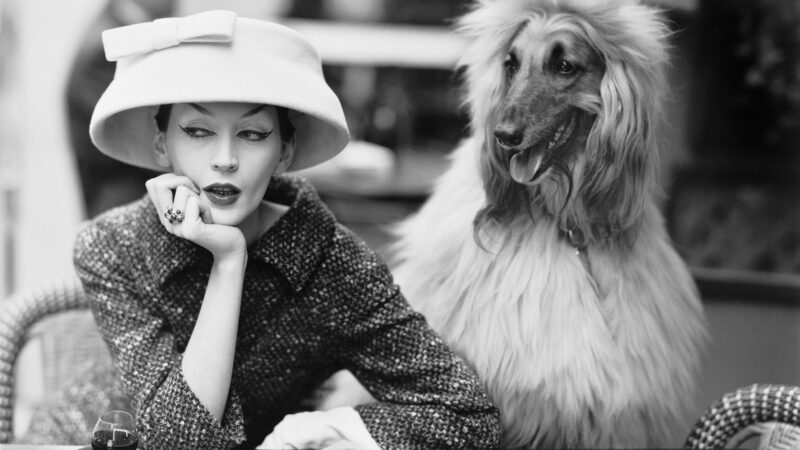 I chose millinery to challenge myself as a more versatile designer. View more of Ely's work here. 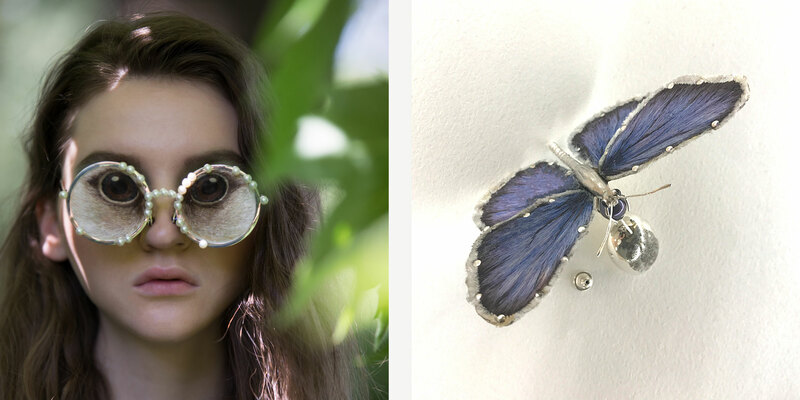 I am a British jewellery designer and maker. I only create things that excite me and evoke a reaction from people. What was the inspiration for the 'Organ Cake' collection? 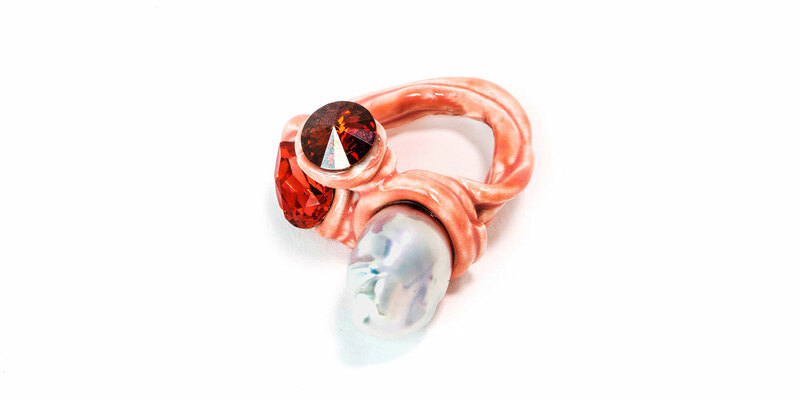 I want to push peoples perception of jewellery, and also investigate the fine line between the grotesque and the sublime. I was inspired by artwork made of intestines and meat, which were presented in a way that didn't make them appear gruesome. I found it interesting how people only have a repulsed reaction once they realise what they're looking at. I love the imperfect shapes that pearls come in. They also acted as a nice counterbalance for my grotesque foam and ceramic pieces. I found it funny to add pearls (a symbol of luxury) onto oozing organ-like objects. It isn’t often that I work with precious stones or materials, so it was a new experience for me. I learnt how delicate they are and how to correctly string them, a technique which I was able to alter to suit my designs. Karl Frisch. His jewellery helped me open my mind to ‘ugly’ settings, and seeing the beauty in the unconventional. Also Grayson Perry has inspired me to just be myself. Someone who likes pink and has a sense of humour. Something that stands out against current design, and it might help if a famous person wears it. I am an open book right now, I can live and work anywhere. I would like to work in the city, or any city, but also live in the countryside. View more of Georgina's work here. My name is Holly O’Hanlon and I’m from Galway, Ireland. I’ve been studying BA Jewellery Design in Central St. Martins for the past three years. The way in which people interact with everyday objects, the associations and feelings the familiar can evoke is central to my work. My priority is to draw attention to the overlooked, utilitarian or mundane and, in particular, to the traces and fragments that remain from a practical task. What was the inspiration for the 'Excess' collection? My starting point for the collection was exploring different forms of excess. Through using slate as my primary material I aimed to emulate surfaces of walls and signage that change through corrosion or human contact and intervention. In doing this I hoped to show how the absence of an object can be communicated through its former location and the material that previously surrounded it- framing the unseen. The fragility of the slate juxtaposed with the lustrous quality of the pearls really highlighted the versatility of the two natural materials - precious merging with non- precious which executed the concept well. Pearls have such an inherent preciousness that only increases once you begin to work with them. 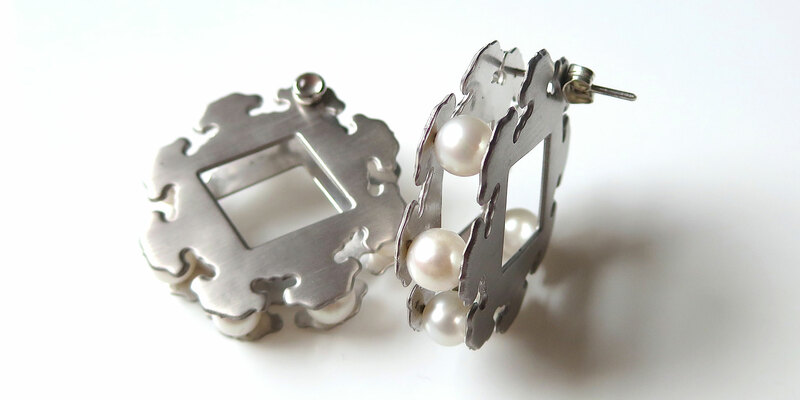 They have such a rich history and I find it interesting to subvert this to a level of utility for example, pearl washers attached to brooches using a silver staple or screw and earring backs that support individually crafted and enamelled silver thumbtacks. To execute my designs , I used a process where I ground each pearl down to emulate the form of a washer- flattening both sides and keeping the finish of the rounded edges intact , the different layers of concentric colours and tones that were revealed were so beautiful and exciting and really added a new dimension to the pearls that previously remained hidden and unseen. Naomi Filmer, the dialogue and balance she creates between her jewellery and the body is so sensitive and equally impactful. She is such a jewellery hybrid and her innovative approach to contemporary jewellery by visualising negative space through her knowledge of materials and processes is something I found really inspiring this year. As my pieces are unisex, I would hope they will appeal to anyone with an appreciation for detail, contrasting surfaces and materials within jewellery which applies a deceptive and playful approach! A piece that utilises an innovative use of craft with a skilled application of techniques in combination with a considered design capability that has a sense of wearability. As of now, my aim is to continue to develop and improve my knowledge and skills within industry in order to learn from people more experienced than myself. However, I am an open door to any opportunity that would still enable me to do what I love - jewellery! I am from South Korea where I studied oriental painting before starting the jewellery course here at CSM. 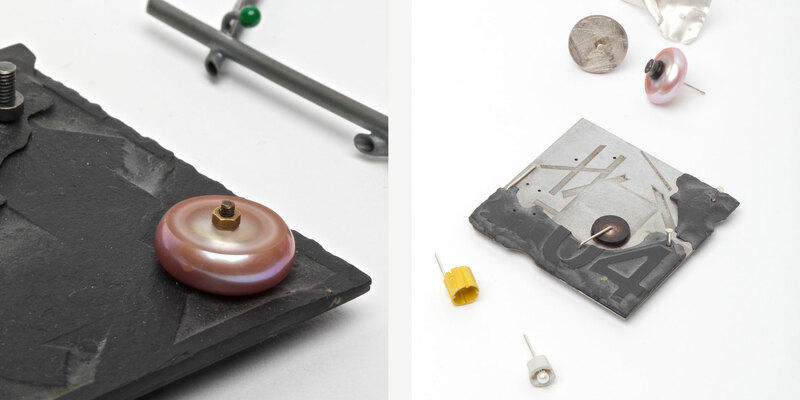 Tradition comes quite naturally as an approach to my work as I enjoy applying skills specific to metal in my work. Nevertheless I state that I am a contemporary jewellery designer using tradition with a twist. What was the inspiration for the 'Crowning Moment' collection? This collection goes along the lines of the work by renowned artist Jeff Koons, in the sense that I am using visual trickery and challenging what is expected of a material. I transform metal into fluid shapes. 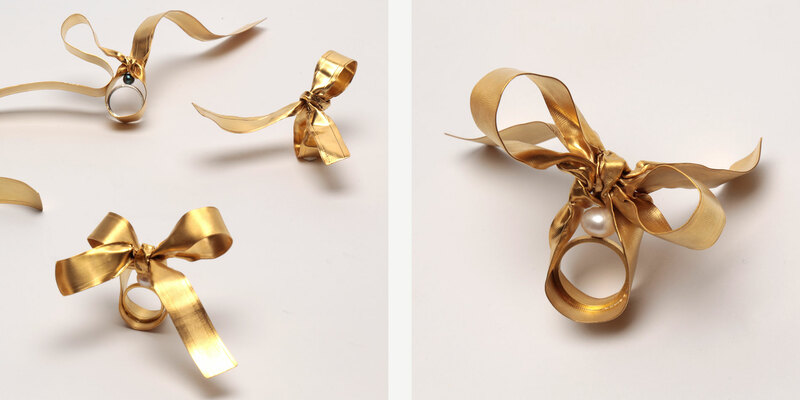 Each piece from the collection represents a different stage of the tying and untying of a bow knot – a gesture that I have enjoyed decomposing to reveal the simple beauty in movement, the celebration of a moment. My designs tend to develop into simple forms that have boiled down my idea to its essence. Pearls represent the simplicity and purity of form that I try to reach in each of my projects. The subtlety in colour, the strength in quality and yet pale and fragile appearance of a pearl seem adequate with any kind of material. It is more of a universal than neutral quality that can be associated with it. In my eyes, pearls against fabric bring forward to extremes of smothers, creating an intriguing contrast. This is why I have integrated a pearl into my centre piece. With the round pearl I used specifically for my collection, I learnt ways of setting in a measured gap. Alexander McQueen has been a great inspiration. He has managed to create his own world with all its intricacies at the top of the immense fashion industry. His pieces are expressive and tailored to perfection. I see my jewellery as accessible to a wide audience. I try to make my ideas clear and I keep them simple so that people can relate or interpret them in their own way. The size of my pieces vary but mostly they become relatively large but remain wearable. I see them as little narratives at hand. I think a design classic is an object that represents the culture and society or group within society from a specific epoch. I would like to get various work experiences within the field of jewellery.